I bought my first Magnolia Ink stamp 12months ago and am now hooked! I have decided to enter my first challenge at Tomic and join other addicted Magnolia Ink stampers in sharing my creations. The challenge is to use pink as the main colour and to also add a bow somewhere. 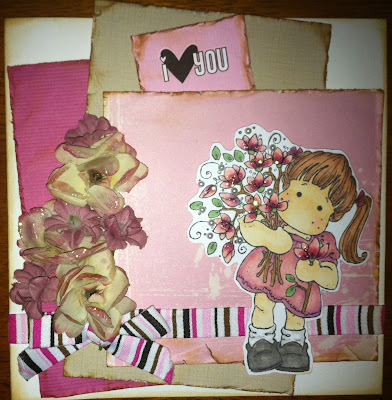 I am not a big lover of pink cards so this was a bit of a challenge. First step was to colour in my stamp. I have used one of my new Magnolia Ink stamps from the Winter Stamp Club "Tilda with Flowers"
I am pleased with the final card. The flowers are from my op shop travels, the card, paper and ribbon are from my scraps. I've inked the edges with Distress Inks Vintage Photo. The i love you rub on is old stock from my years as a TLC Consultant. I've also added kindy glitz to the flowers and some Kaiser pearls. Op shops are the best place for flowers and lace. I just buy fake bunches of flowers and pull them apart. Still need a bit of work on my copic colouring. I think I need a couple more lighter pinks. Love an excuse to go buy more copics! Ohh my Michelle! Your card is gorgeous!! You have colored Tilda to perfection! Thanks for joining TOMIC this week. A beautiful card... It's so interesting to hear how other people create too :) I have to have my card made before I colour my image! I don't know why I've just always done it that way! Love the tip about the flowers... I hadn't thought of that.